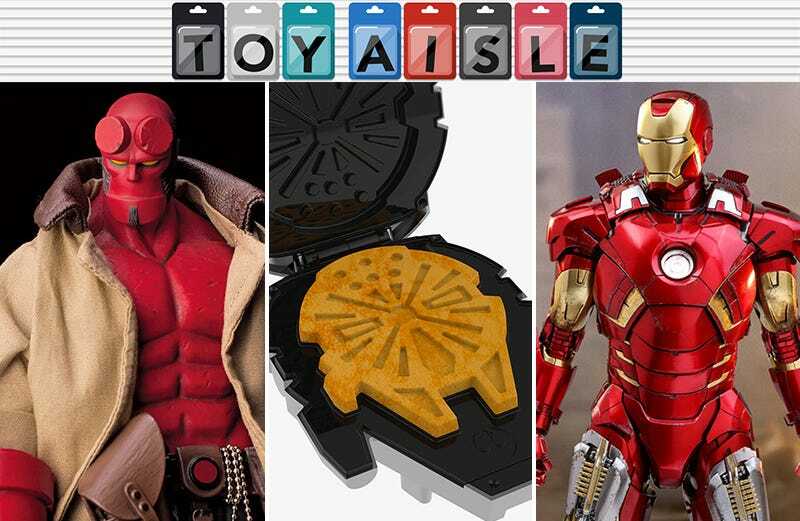 Welcome back to Toy Aisle, io9's weekly round up of all things fun, collectible, and frivolous. San Diego Comic-Con is but a distant memory at this point, but thankfully there’s still plenty of toy news to be had. Lego’s still pumping out new sets, Jell-O’s trying its hand at making edible toys, and we’ve got some fun new stuff for fans of Hellboy, Golden Girls, and waffles—is there really a distinction between the three? Dark Horse worked with Japanese toymaker 1000toys and creator Mike Mignola to create this 7.5-inch, fully articulated PVC Hellboy figure that includes a posable Right Hand of Doom, Excalibur sword, and Beast of the Apocalypse swappable head. There’s even wire sewn into the seams of Hellboy’s tiny cloth jacket so you can create the perfect windswept pose. It will ship as early as May of 2019, which gives you quite a few months to raise $120 to add this one to your collection. At the tail end of Comic-Con, Hasbro and Blizzard revealed a nice gift for Overwatch cosplayers. Next year a series of Overwatch-themed Nerf blasters will be released, including the Reaper’s Hellfire shotgun that fans will apparently need to buy two of to properly complete their costumes. The blaster will actually be a part of Nerf’s Rival line, which can blast tiny foam balls at speeds up to 70 miles per hour—so don’t get caught pulling the trigger in the middle of a crowded convention floor. How many 12-inch Iron Man figures has Hot Toys created by now? It must number in the hundreds at this point, but clearly collectors are happy to shell out for every iteration of Stark’s super suit. Based on the Iron Man VII armor from the original Avengers movie, what sets this “Special Edition” apart from previous iterations is that it’s mostly made from die-cast metal, giving it a lovely finish that helps justify a $430 price tag—oof. You’ve obsessed over reruns, and maybe you’ve already made room for a Blanche Chia Pet on your windowsill, but how much do you really know about the Golden Girls? Are you confident enough to challenge your friends to a game of Trivial Pursuit featuring 600 questions based on the ‘80s sitcom? You can consider this a “lite” version of the iconic quiz game; there’s no board or tiny pies to fill, just a stack of question cards and a custom die that decides which category your stumper comes from. Bring it on. Thanks to Lucasfilm’s inability to ever say no to a merchandising opportunity, this isn’t the first Millennium Falcon waffle maker we’ve stumbled across. It’s also $10 more expensive than previous versions, so why fork over $50 for another appliance cluttering your kitchen counter? Just look at this thing! In addition to churning out Falcon-shaped waffles, when closed, this waffle maker’s stainless steel housing makes it look like a shiny version of Han’s ride. Even if you never actually put a drop of batter inside it, you’re still going to want one of these for your kitchen. Movies can be art, video games are on the fence, but toys? You won’t find a carded Hot Wheels die-cast vehicle hanging in the Louvre, but Mattel’s latest attempt to lure collectors is a new series of pop art-inspired Thomas the Tank Engine minis toys. Andy Warhol would have probably appreciated the Diesel 10 wrapped in a technicolor collage of Sir Topham Hatt, but would Piet Mondrian been as thrilled to see Annie the coach covered in his bright, blocky patterns? I’m sure Keith Haring never expected his work to show up on a tiny train car, but I bet he’d be honored.